These are the apparently offending images singled out by the estate of George Orwell for allegedly violating the “1984” copyright. George Orwell’s 1984 imagined a bleak bureaucratic future where free speech was easily inhibited. Perhaps the people who run his estate (and certainly the people at Cafe Press) should read the book; or at least brush up on copyright basics. 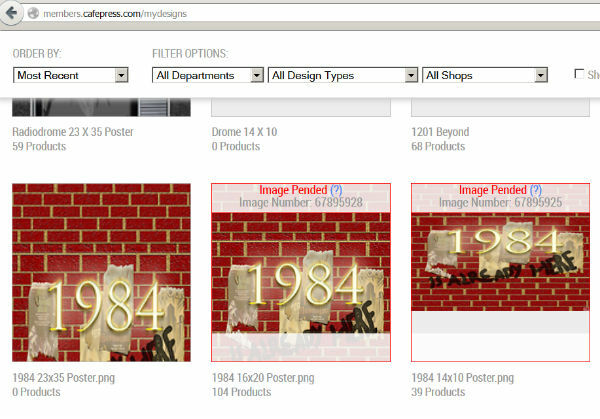 But exactly what was demanded by the estate is in question, as the literary rep who filed the claims with Cafe Press tells Consumerist that he was not targeting the design shown in the above screengrab, which features only the number “1984” and some scribbling that declares “is already here” in addition to the numbers. On thing that is certain is that the mere number “1984” is not eligible for copyright protection. U.S. Copyright Office regulations declare [PDF] that “words and short phrases” are not copyrightable. “Similarly, individual numbers, letters, sounds, and short phrases consisting of such elements are not copyrightable, because they do not contain sufficient creative authorship,” according to the Copyright folks. The copyright notice sent to Cafe Press referred to “George Orwell quotes” as being the offending content, but even if the phrase “is already here” is somewhere in the book 1984 (Disclosure: we haven’t had the time to re-read the book this afternoon), it’s such a generic phrase and so short in length that it most certainly does not merit copyright protection. In his statement to TorrentFreak, the estate rep seemed to defend the takedown demand. “The estate has never licensed merchandising, nor have the licensees of the relevant film rights, under which merchandising usually comes. Some of the merchandising I asked to be taken down was in clear breach of copyright,” he told TF. All of which raises the question of why these “1984” shirt designs were removed if, as the rep claims, he did not demand their takedown. We’ve e-mailed and called the intellectual property agent at Cafe Press but have not yet received a reply. Previous IKEA Creates Stuffed Animals Based On Kids’ Drawings Because What Do Adults Know About Toys, Anyway?